As a form of recreational light, “glow sticks” are popular options for children who go out trick-or-treating on Halloween and are fun options at parties and other recreational events. However, they have many practical uses as well. They are great options for safety lighting and are popular devices for the military, law enforcement, and other emergency personnel. They are useful for signaling, illumination, surveying, perimeter control, and many other uses. Cyalume safety products has taken advantage of the glow stick’s potential as a safety product by creating a line of industrial and military-grade chemiluminescent “Lightbars.” Cyalume Lightbars are single use products that contain non-toxic hydrogen peroxide and dye that produce a chemical luminescence when combined. Fresh out of the package, illuminating substances are separate. Generally, one is in a glass ampoule and the rest surrounds it. When the consumer wants to use it, they bend the stick to break the barriers between the substances. Another option is to shake it hard to make an encased steel ball do the work. As the substances begin to combine, they start to glow. Perhaps the biggest benefit of Cyalume safety products is the fact that they are waterproof and non-toxic. This means they work in just about any weather condition and are always safe to use. Other benefits include consistent light output without needing batteries, shelf life of several years, and easy storage. When needed, they can start emitting light within seconds. Among Cyalume’s products are military-grade 6-inch light sticks, high-brightness “Impact” Lightbars, and the LightStation and S.E.E. evacuation kits. Cyalume has also started making the SnapLight flare alternative, which is a non-toxic alternative to traditional road flares. 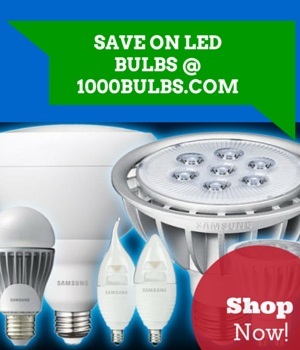 For these products and more, visit 1000Bulbs.com.